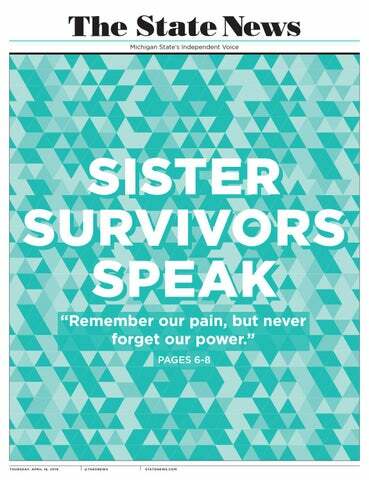 A speaker series titled “Finding our Voice: Sister Survivors Speak” will begin this week at the Michigan State University Museum. The MSU Museum and The Army of Survivors — a sexual assault survivor support network created by a number of those who survived ex-MSU doctor Larry Nassar's abuse — partnered to establish the speaker series, which will run throughout the spring. The series is comprised of five separate panel dates, with the first set for 5:30 p.m. on Jan. 15 in the museum's Entry Hall. That panel — titled "Understanding Trauma: Scientific, Clinical, and Interpretive Perspectives on Sexual Violence" — will feature representatives from The Army of Survivors and MSU's Department of Psychology, Department of Human Development and Family Studies and MSU's Sexual Assault Program, or SAP. MSU Museum Director Mark Auslander said the purpose of the first panel is to bring "clinicians, researchers and survivors" into conversation with each other. "The first one is on trauma, trying to put together the kind of new research that’s been done on the health impacts of sexual violence trauma with clinicians so we understand what are the best practices now that are informed by research on understanding the impacts of sexual violence,” Auslander said. Auslander said the series acts as a lead-up to the April 16 opening of the MSU Museum’s new exhibition, "Finding our Voice: Sister Survivors Speak." The exhibition was inspired by the hundreds of teal ribbons and bows tied around MSU campus trees in winter 2018 as tribute to the Nassar survivors. The ribbons were being damaged because gypsy moths — a highly invasive species — were nesting in them. The Sister Survivors, their mothers and the MSU Museum worked to preserve them, according to Auslander. “At the museum, we just felt, ‘This is so precious’ – to document these and protect these," Auslander said. Those teal ribbons and additional art, poetry, text and visual contributions from survivors will be on display when the exhibition opens in the spring.